Bitcoin remains a wholly under appreciated technology, despite the growing interest in the underlying blockchain. There are several key features that make bitcoins a great alternative to bank-issued fiat currencies, including the decentralisation and consensus the software is built on. The peer-to-peer nature of the cryptocurrency makes it an extremely effective, low-cost means of transferring funds all over the world. This leads to a question which is regularly discussed: Is Bitcoin most useful as an online currency which is used for regular everyday spending, or as a more specialist asset where use is focused towards cross-board transfers and remittance? The cryptocurrency is often cited as a great option for remittance, but the international money transfer market is plagued by heavy regulation, which businesses offering Bitcoin remittance services are unlikely to be able to avoid in the long run. For example, CoinCave, a Bitcoin remittance start-up was forced out of the US market, due to regulation and difficult to obtain licenses. The difficulties faced by Bitcoin start-ups focused on the remittance sector are related to the complex international arrangements aimed at preventing money laundering. Complicated regulatory frameworks are in place, and these are largely responsible for many of the negative aspects of existing remittance services such as Western Union, including the high fees that they charge. Despite this, Bitcoin can be used as an effective means of sending funds all around the world and as use of the cryptocurrency becomes more widespread, bitcoin-based remittance services will likely become more and more viable. As bitcoins cannot easily be spent in most parts of the world currently, remittance services must convert users’ funds at each end of the transaction. This is not particularly efficient, but as more and more services appear which facilitate the spending of bitcoins, remittances using bitcoins could become more affordable and appropriate for a wider range of people. There are already services which allow the purchase of gift cards and virtual debit cards using bitcoins; enabling people to really put the cryptocurrency to use. 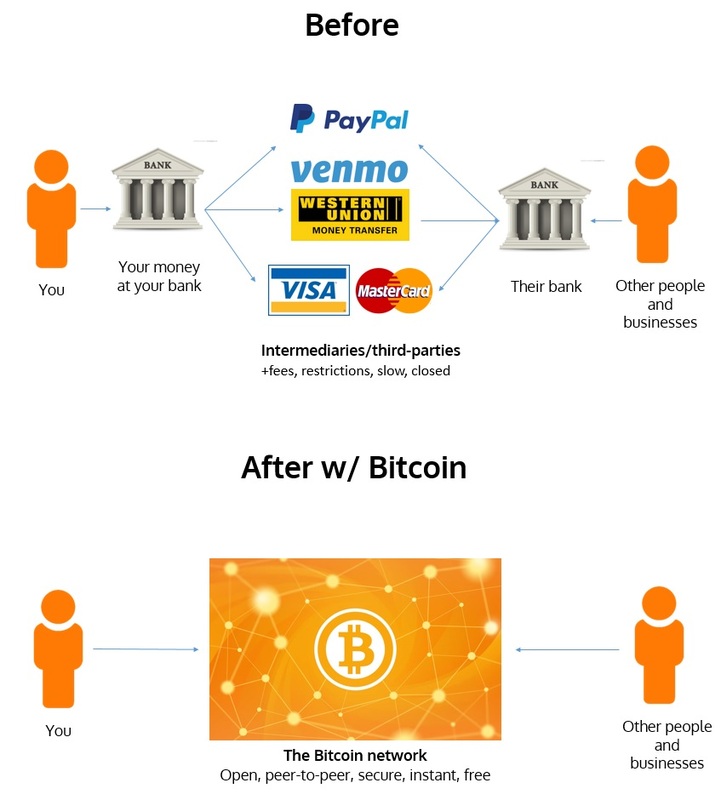 But if the people receiving remittance payments were able to easily spend their coins at local businesses then the need to convert transferred payments into the local currency, and therefore also the need to go through a regulated remittance service rather than just using direct peer-to peer payments, would be greatly reduced. This, in turn, would make Bitcoin a much more cost effective solution. An ever-increasing number of transactions are made using e-commerce systems, where bitcoin could easily be integrated. As growing numbers of people use and engage with Bitcoin, the cryptocurrency could be utilised more for online purchases. There are also growing numbers of freelancers who are being paid with bitcoins; as the work-life balance shifts and the internet changes the way we work, could bitcoin become a significant, or even dominant currency? The cryptocurrency is a cheaper means of paying for goods than PayPal, and businesses are protected against chargebacks. Although intended as a protection for consumers, chargeback capabilities are often abused and can cause many issues for businesses. The irreversible nature of bitcoin transactions puts a stop to this; consumers are essentially forced to trust businesses which has positives and negatives. Escrow systems can help to limit the trust required by users, by essentially adding in a third-party mediator. New developments such as bitcoin debit cards bridge the gap between businesses who aren’t yet using the cryptocurrency and active users. These will surely help to bring about greater adoption as people can actually use their bitcoins for everyday purchases. The fact is that Bitcoin is more than capable of facilitating both e-commerce transactions and remittance. In the developing Bitcoin economy there are well-backed start-ups facilitating both potential uses of the cryptocurrency. Through incremental development, each of the different use-cases for cryptocurrency may add to the effectiveness of the others. Remittance, in particular, will become more practical and cost effective if more people are earning and spending their coins rather than just buying and selling for fiat at each end of the transfer. Ultimately the nature of regulation will always be a challenge to overcome, but Bitcoin definitely has potential to make a greater mainstream impact!